One of the drawbacks of using swipe or proximity cards to measure attendance is misuse – what has become known as ‘buddy punching’, the act of one employee clocking in or out for another. Biometric devices are the latest measures to eliminate any kind of misuse of the system, as the employee must physically be in the presence of the terminal to register. 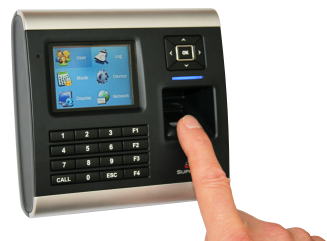 There are two main types of Biometric Terminals, both of which are available with all our systems. A Hand Geometry Reader is perhaps the most common Biometric device. It scans the hand making over 31,000 different measurements and checks the result against a stored mathematical algorithm. The Hand Reader is robust, reliable, and is ideal for unsupervised sites. The next level up from the Hand Geometry Reader is a fingerprint reader. This reads the fingerprint of each employee and stores the data as an algorithm. It is impossible to reconstruct a fingerprint from this algorithm, meaning the privacy of the employee is protected. Even so, the system can easily differentiate between 50,000 different fingerprints. Identification takes less than one second. 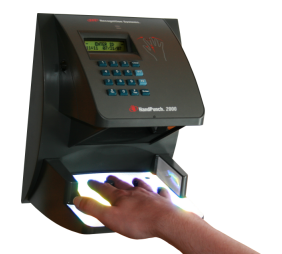 With both Biometric systems, you eliminate all problems associated with ‘buddy punching’, but also lost/forgotten/replacement ID cards, as the employee’s hand is the only required information. Biometric terminals can be used instead of more conventional terminals or alongside them. As well as Time and Attendance, they can be set up at certain points in your company to act as access control for certain areas, and can be used in conjunction with a pin number for increased security.